We combine quality with exceptional value for money for all your Seeds for Annuals, Perennials, Vines, Trees and Shrubs, Vegetables and Herbs as well as hundreds of Bearded Iris cultivars, sowing & gardening supplies. Checkout our selection of new and unique items, many not available anywhere else. 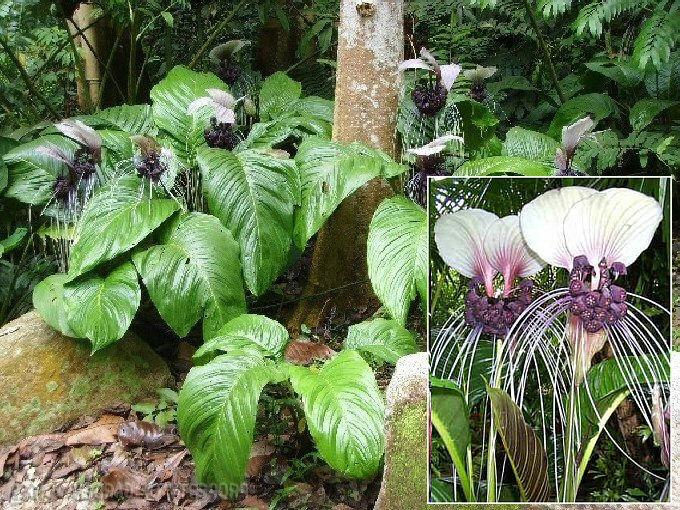 The genus Tacca consists of long-lived, short stemmed, rhizomatous or tuberous herbaceous plants. In the wild, it occurs in the understory of rain forests in deep shade. This Batflower is native to Asia. This plant is a fast grower. It can reach up to 4ft in height. Each plant produces at least 6 and up to 12 flower stems during the warm months of the year. Delivery times may vary. Allow 1-2 weeks for deliveries within Canada, 2-3 weeks for U.S. and 3-5 weeks for International deliveries. Seeds will be shipped via Standard Ground Mail Service. Tracking numbers and services are not available for this type of shipment. All other Home and Garden items will be shipped via most economical. Tracking numbers will be available on items shipped Expedited or Express Parcel Post. Items being shipped outside Canada may be subject to import laws, duties and taxes. The duties and taxes will be assessed when the package reaches the destination country. The recipient is responsible for these and any other additional charges. Unfortunately, we can not control or determine the duties and taxes that will apply to orders being shipped outside of Canada because policies vary. Contact your country's custom office for more information. When ordering from us, you are the importer on record and must comply with all applicable laws and regulations of the country in which you are receiving the Goods. You can securely complete your payment with your credit card, eCheck or money transfer. Simply put, PayPal lets anyone with an e-mail account send money securely to anyone else with an e-mail account. Local pick-up option available. Please contact us to make arrangements as we are only available at specific times of day. Your payment is due within 10 days of your purchase. Please combine ALL your purchases into one payment! STORE / MERCHANDISE CREDITS ONLY! NO REFUNDS, in part or in whole, shall be given! Buyer must notify La Vie En Rose Gardens of problem with merchandise within 3 days of receipt. Merchandise must be returned to La Vie En Rose Gardens and postmarked within 14 days of receipt. Merchandise must be shipped in the same condition as received. All merchandise tags and/or stickers must still be attached and seed packets must be UNOPENED. Buyer pays for all shipping/handling fees. The store/merchandise credit consists of the purchase price of the returned merchandise only. Shipping/handling fees do not qualify for Store/Merchandise credit. Store/Merchandise Credit will be applied to buyer's account within 10 days of our receipt of the returned merchandise. Your seeds are guaranteed to arrive as described or we will replace them. If a replacement is not available, we reserve the right to substitute at equal value of purchase price. Many factors such as temperature, moisture content, light and planting media affect seed germination. These factors are completely out of our control and are the buyer's sole responsibility and risk. As such, we will not unconditionally guarantee successful germination with your seed. We will, however, help all we can to find a solution if you encounter a problem. Although we ship our seeds worldwide, we may not be aware of the regulations that pertain to the importation of seeds to your country. Because import regulations vary and can change frequently, we urge you to check with your local authority before placing your order. Our replacement policy is not applicable to orders that may be confiscated by an importing authority.